Last weekend I ventured out in the Texas heat to walk around the Dallas Arboretum. I love places like this. All those beautiful plants, all the planning that goes into it… and I didn’t have to do any of the work! I’m very happy to let someone else take the responsibility, and I gleefully handed over my entry fee to get a chance to check out the Chihuly exhibit. 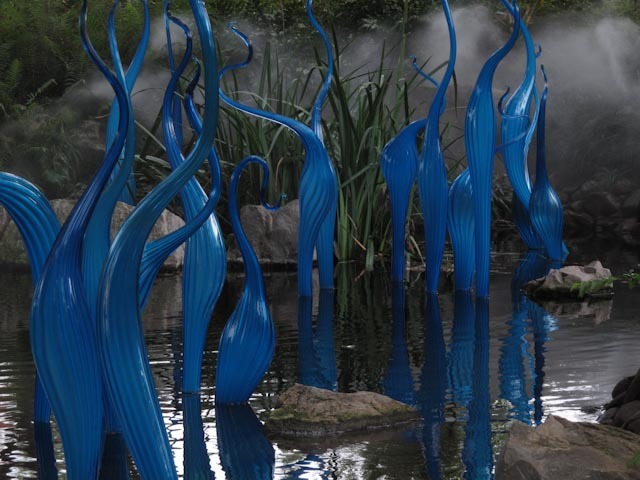 If you’ve never seen one (you probably have, even if you don’t realize it), Chihuly designs amazing sculptures in glass. It shocks me that they even consider putting something that fragile out in the elements for the hail/wind/rain/sleet/tornado/children to assault it. I’m happy they did though, because the combination of colored glass surrounded by nature was inspiring. For instance, the image above is one of my favorites from the day. I consider it pure brilliance to combine those shapes, that color, and the misty fern gully. It transformed the entire place into an alien world I’d quite like to visit, and I’m pretty sure I will in future stories. Imagine walking down a path in the forest, the mist rising from the water laden with living green things, bees buzzing here and there, and then chancing on these blue spears rising up out of the water. They look like they’re about to grab someone, or maybe they’re reaching for the sun. Or maybe they’re simply reaching for your imagination. If you haven’t been, and you’re in the Dallas area, please go check it out. It’s much better in person. The exhibit is there through November 5th.